My latest post for Drop Dead Clothing is allllll about breakfast. I’m actually not that big into breakfast foods, but I have always liked breakfast for dinner. Pancakes at suppa time, yes please. I feel like it’s way too difficult to find vegan options for breakfast when you’re dining out. 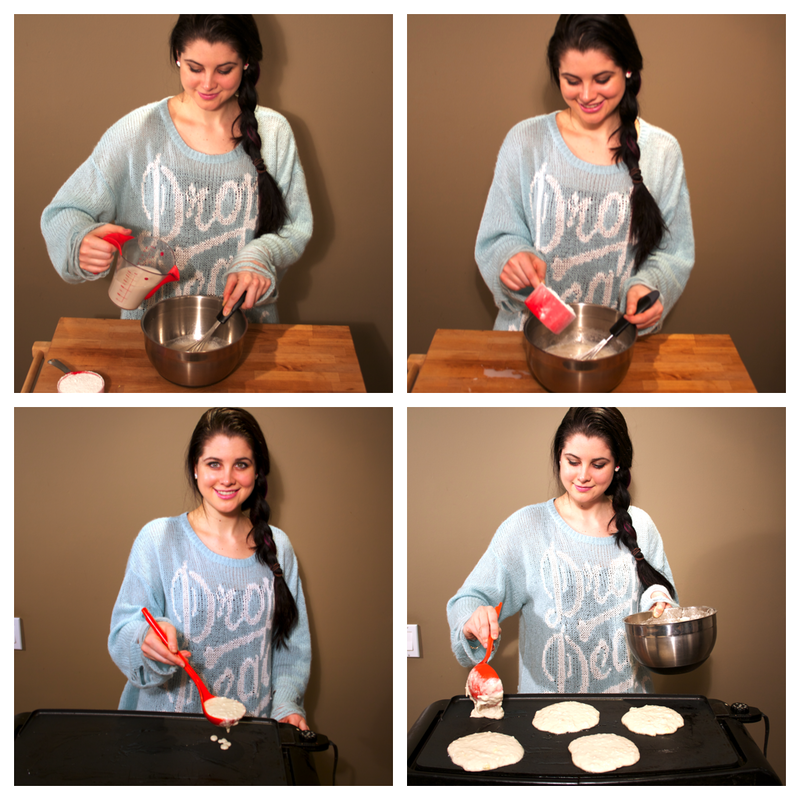 It’s a lot easier to stay at home and whip up these pancakes! No eggs, no dairy! 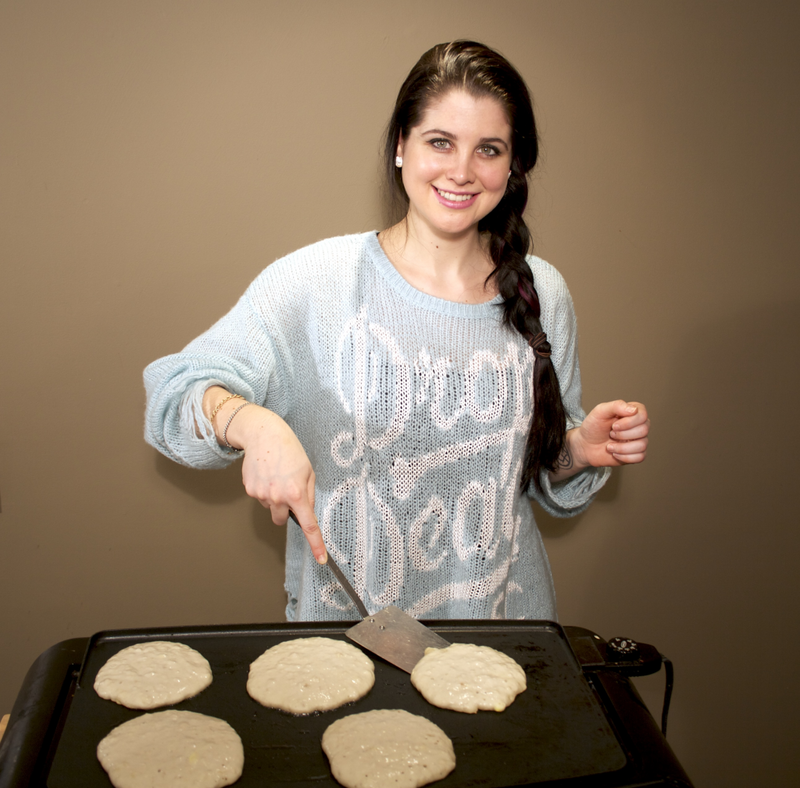 I also made these pancakes wearing my new fav sweater. It’s so cozy, and I normally wear a lot of black, so I like the light blue for a change. 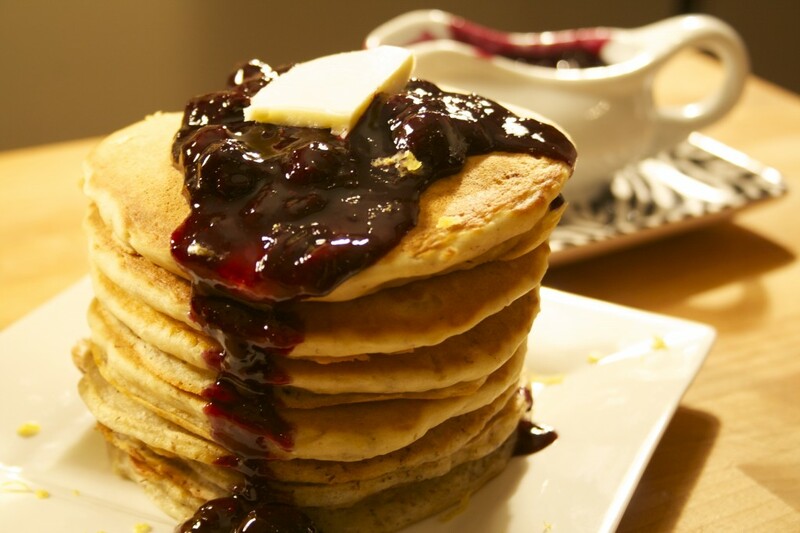 These are lemon-flavoured vegan pancakes topped with a mouth-watering blueberry sauce. Has anyone seen Pulp Fiction? I love the part when that lady is talking about pot-bellies, and she says she wants blueberry pancakes for breakfast, with a tall glass of orange juice, and a slice of blueberry pie for dessert annnnnnd then Bruce Willis goes crazy. Annnnnnyway. 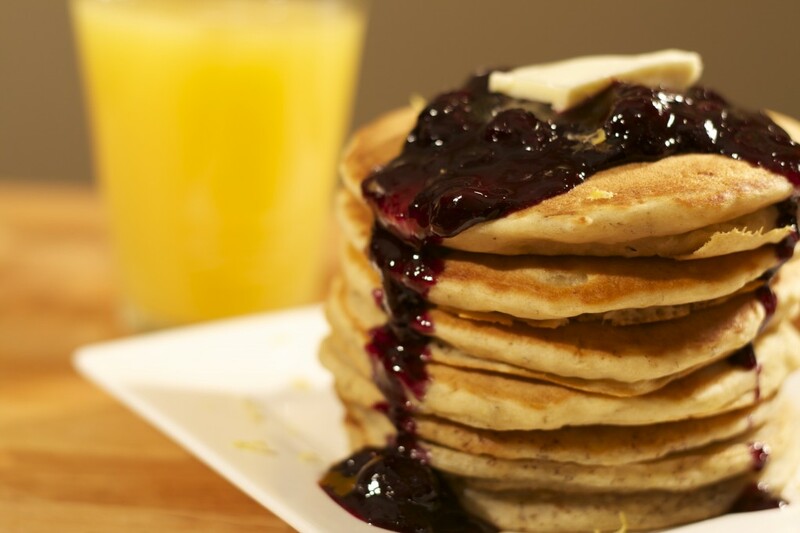 Try these pancakes for breakfast- or dinner. Sometimes it can be hard to find vegan options when it comes to breakfast, especially at restaurants. Bacon, eggs, pancakes and waffles are usually outta the question and when everyone else is chowing down on a massive greasy breakfast, I usually feel like a little more than toast. 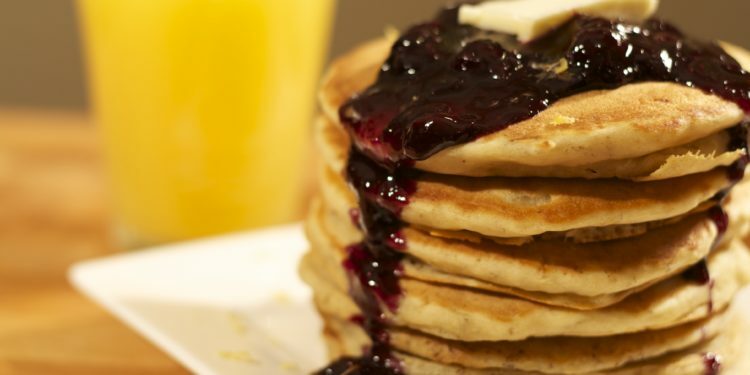 These pancakes are the perfect solution. Stay at home and whip them up for you and your friends. They are so good, and you won’t miss out on a decadent breakfast again. 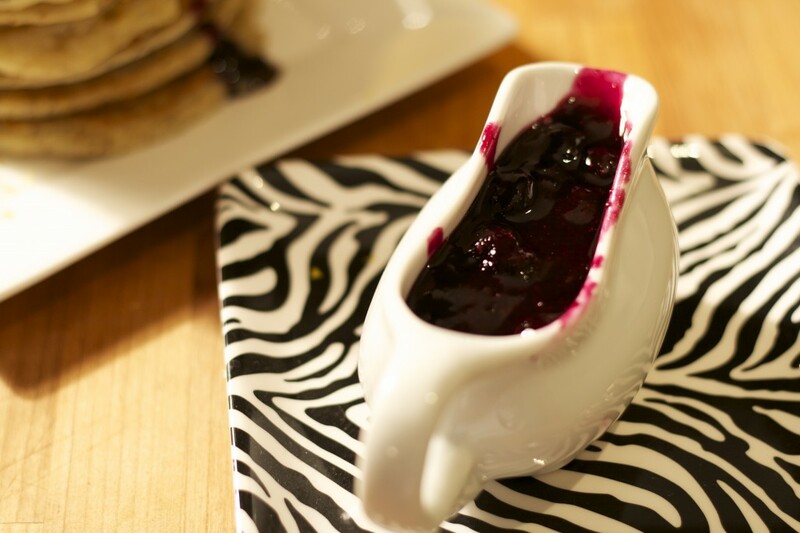 These pancakes are really quick to make, and the blueberry sauce can be made ahead of time, too. Wash these down with a tall glass of orange juice and you’re ready for the day…or ready to go back to bed. I’ve tried this recipe with a whole bunch of different flours. If you want familiar, classic pancakes, use all-purpose flour. If you want something a little healthier you can try whole wheat pastry flour, or a mixture of white and whole wheat flour (let’s say 1/3 cup whole wheat and 2/3 cup all-purpose). I’ve also accidently used bread flour before which seemed to work fine, too…but maybe only if you’re desperate. Use the batter immediately after making. Add apple cider vinegar to almond milk and let sit 5-10 minutes, until curdled. Pour into a medium sized mixing bowl and add mashed banana, vegetable oil, sugar, and lemon zest. Mix well. Add flour, baking soda, baking powder, and sea salt. Whisk until mixture just comes together; it will still be lumpy. Do not over-mix. Preheat griddle or frying pan to medium heat (I set mine at 350 degrees F/ 177 degrees C) and lightly oil. Ladle batter onto pan or griddle, about 1/4 cup at a time. When pancakes are slightly hardened around edges and bubbles are forming and popping on top, flip over and cook through. You can keep these warm in a low-heat oven (200 degrees F / 93 degrees C) as you make them all. 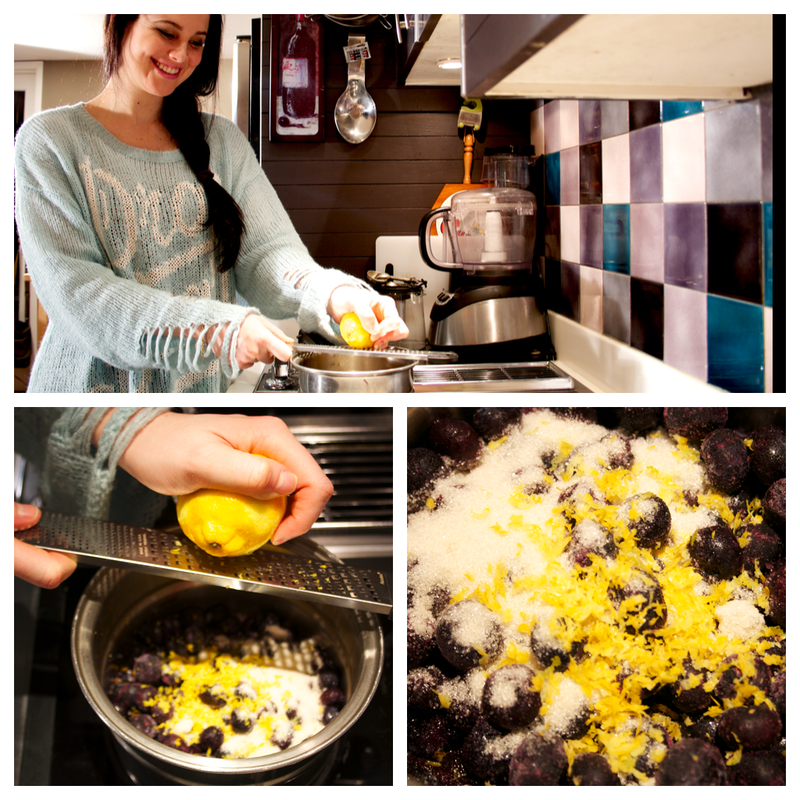 In a saucepan, add blueberries, sugar, lemon juice, lemon zest and cinnamon. Mix arrowroot or cornstarch with cold water and a small bowl until well mixed. Whisk into blueberry mixture and bring to a boil. Reduce heat to a simmer and simmer until thickened (a few minutes). Remove from heat. Use immediately, or keep in the fridge.